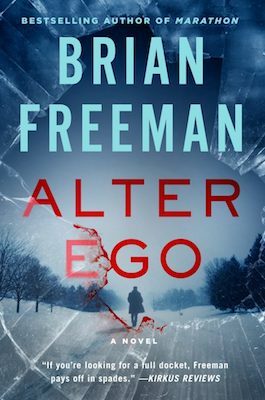 In the following exclusive excerpt from Alter Ego, by Brian Freeman, a detective goes to visit the production set of a film based on his own hunt for a serial killer, only to find that an intern’s gone missing from the set. Freeman is an internationally bestselling thriller writer, and has had works published in 46 countries and translated into 22 languages. In what felt like an out-of-body experience, Jonathan Stride watched himself sprint toward the hunting lodge on the shore of the small lake. He could see himself from the side, where silver sprays of snow washed across his face. His black-and-gray hair was pushed back by the wind. He could see himself from above, running along the narrow dirt road through ruts of ice. He could see his face screwed up with intensity as he neared the tiny cabin. There, inside an eight-foot by eight-foot cage, a young woman was near death and running out of time. It wasn’t real, of course. None of it was real except the Duluth snow. The detective on the road was actually a Hollywood star named Dean Casperson. A camera followed Casperson on railroad tracks built beside the road. A drone filmed him from overhead as he ran. Microphones picked up the sound of his breath and the whistle of the wind. As Stride watched, Casperson reached the wooden door of the shed and ripped it open. The actor, the director, the camera operators, the sound engineers, the gaffers, the grips, the production designers, and the location manager all began to reset for the next take. The crew worked quickly. It was already midafternoon, and the natural light wouldn’t last long. Days were short in January, and time was money on a movie set. Eleven years earlier, Stride had rescued a young woman named Lori Fulkerson from a cage that was almost identical to the one on the set. It had been built by a serial killer named Art Leipold. Lori had been his fourth victim. Stride had been too late to save the three earlier women who had died while Art played his game of cat and mouse with the police. The movie script took liberties with what had really happened when Stride rescued Lori. He hadn’t been alone. Maggie Bei and half a dozen other police officers had stormed the remote hunting lodge with him. The real cabin wasn’t anywhere near a lake; it was hidden inside a few acres of forested hunting land. But this was the movies, where reality didn’t mean a thing. The only thing that mattered was what looked good on the big screen. But this was the movies, where reality didn’t mean a thing. The only thing that mattered was what looked good on the big screen. Even so, the Hollywood version made Stride think about the past again. He hadn’t even been forty years old back then. His first wife, Cindy, was still alive. It would be three more years before she died of cancer. He’d just been made the lieutenant in charge of the city’s detective bureau that summer. The audio CD that had arrived at his desk on a sticky July day was like a grim welcome to the responsibilities of his new position. The tape was of a woman breathing raggedly, crying, and banging on the walls for freedom. She said the same four words over and over. That was what made the case so personal. Every victim used his name. The voice on the tape belonged to a St. Scholastica journalism student named Kristal Beech. She’d gone missing after the evening shift of her job at Maurice’s at Miller Hill Mall. Stride and his detectives had analyzed the sound recording for clues to her location. They’d done chemical analyses of the envelope, handwriting, and postage stamp. They’d delved into Kristal’s life to find out who could have taken her. Next time came two months later. Tanya Carter was a twenty-five-year-old waitress at Bellisio’s in Canal Park. Stride had received another CD with a message from Tanya: Save me, Jonathan Stride. As before, he and his team had no idea where she was being held and no clues about the killer’s identity. And as before, they didn’t find her. It happened all over again just before Thanksgiving with a thirty-one-year-old publicist for a nonprofit organization named Sally Wills. The third victim. After that, for six weeks the killer went silent, but they knew he wasn’t done. In January, during one of the city’s most bitter stretches of cold weather, the next audio CD arrived. This time the woman was Lori Fulkerson, a twenty-two-year-old bookkeeper. The message was the same: Save me, Jonathan Stride. The only thing that was different was that the killer finally had made a mistake. They found a small broken shard of plastic from a pen in Lori Fulkerson’s apartment. The killer must have dropped it, stepped on it, and then tried to pick up the pieces. Maybe he was hurrying because of the cold, but he missed a piece. The fragment of plastic had a partial fingerprint on it, and the fingerprint led them to Art Leipold. From there, they’d located Art’s hunting cabin in the remote woods. That was where they found Lori Fulkerson. “Brings it all back, doesn’t it?” said a voice at his shoulder. Stride turned and found Chris Leipold standing next to him. Stride’s lips twitched into a smile. He’d resisted Chris’s invitation to talk about the case as Chris did the research for the screenplay. He had no interest in having his life dramatized for the world to see. After nine months of playing hard to get, he’d fi relented. Stride’s new wife, Serena, had encouraged him to do it. So had Cat Mateo, the teenage girl who lived with them. When Serena and Cat teamed up, Stride found it hard to say no. So he and Chris had spent a weekend talking about what Stride had gone through as each victim died. Along the way, they’d become friends. Chris wasn’t a big man. 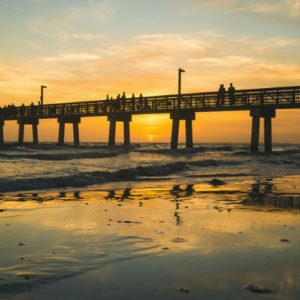 He was slight, five foot six, with a narrow face and thinning sandy blond hair. He wore tiny wire-rimmed glasses over his brown eyes that made him look like a scientist rather than a writer. A decade of L.A. weather had thinned his blood. He looked cold even in a heavy down coat and a Fargo-style hat with ear flaps. Stride, by contrast, wore only his decades-old leather jacket and a dark green wool cap that bore the word north in red stitching. Fifty-one years in Duluth had made him oblivious to the frigid temperature. “I’m glad you decided to check out the filming,” Chris went on. “I wasn’t sure we were ever going to see you out here.” “Actually, it’s not a social call,” Stride said. Stride peeled off his gloves and took a phone from his pocket. “This is hard to look at,” he warned Chris. He found a photograph and enlarged it to show the face on the screen. “Meanwhile, as long as you’re here, would you like to meet your alter ego?” Chris asked. Stride spotted Dean Casperson on the other side of the field, surrounded by an entourage. The actor was drinking from a bottle of Fiji water, and like Stride, he seemed unaffected by the cold. Their eyes met. Casperson knew who he was. The actor lifted the water bottle in a toast. He pushed his cowlick away from his eyes and gave Stride the boyish grin that every moviegoer in the world recognized. He’d been one of the biggest box-office draws in the world for almost forty years, ever since his scene-stealing turn in a Robert Altman film as a teenage concert violinist blinded by a blow to the head. He’d left the audience in tears. From that moment forward, he was a star who grew quickly into a legend. Over the years, Casperson had made a specialty of accepting wildly different roles with every new film. It didn’t matter whether he was a hero or a villain or whether the film was a thriller or a comedy. He was simply one of those charismatic players who made you not want to look away from the screen. He was also one of those rare Hollywood actors who was as popular off-screen as he was in his movies. He steered clear of politics. He had an easy laugh and a humble way about him when he appeared on the night-time talk shows. He’d been married to his high-school sweetheart, Mo, for decades. Casperson had survived three decades in the world’s most backstabbing business with a reputation as a nice guy, but that was partly because few people really knew him. He and Mo rarely ventured outside their bubble. They kept a small, tight circle of friends. They lived in Florida, not Malibu. They were careful never to let their public masks slip. Chris Leipold waved Casperson over, and the seas parted for the actor as he crossed the field toward Stride. He carried an aura that made other people defer to him. Casperson extended his hand as the two men met. Casperson had survived three decades in the world’s most backstabbing business with a reputation as a nice guy, but that was partly because few people really knew him. In fact, Stride couldn’t remember the last time he’d seen a Dean Casperson movie, but he knew that the expected thing to do with famous people was to stroke their egos. He’d met dozens of actors and singers at Duluth events over the years, and most of them were insecure about their fame. The gleam in the actor’s eyes let Stride know that Casperson was well aware that he was being flattered. Obviously, Casperson didn’t need anyone pretending to be starstruck around him. Stride smiled, because he knew he was being flattered right back. He was cynical enough to wonder whether Casperson was sincere or simply practiced at saying the right things to strangers. He sized up the man who was playing him in the movies. Casperson was smaller in real life than he appeared on the big screen. Stride was over six feet tall, and Casperson was at least four inches shorter. The actor was several years older than Stride, but he had the Hollywood ability to appear years younger than he was. At fifty-five, he could have passed for forty. Casperson’s hair was whatever color and style the movie needed it to be. In this case, it was much like Stride’s: wavy, unkempt, and laced with gray. Otherwise, the two men looked nothing like each other. Stride had a weathered face that was like a map of every winter he’d experienced. Casperson’s face featured a strong chin, a sharp nose with a bulb at the end, and arresting sky-blue eyes. “Are you enjoying Duluth?” Stride asked. Stride doubted that any home Casperson had found in Congdon Park was a little place. More likely, it was a sprawling brick estate from the city’s glamour days in the previous century. When Casperson realized that Stride didn’t know what he was talking about, the actor’s blue eyes shot to Chris Leipold. In that instant, Stride could see an angry flash of the man’s power. It was like watching a tiger and realizing that he could eat you whenever he wanted. “Didn’t you call him, Chris?” Casperson asked. From Alter Ego. Used with the permission of the publisher, Quercus.Copyright © 2018 by Brian Freeman.